Juniors Cydnie Wilson, Lauren Heet, Kalyn Flora and Gavin Eads take a picture of their reflection in the Cloud Gate sculpture at Millennium park. 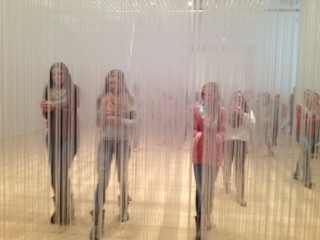 Freshmen Nicole Sechrist, Hannah Wanemacher and Emma Ross walk through a sculpture in the Art institute of Chicago. 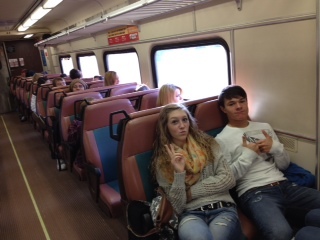 Freshmen Hannah Wanemacher and Max Slusser on the South Shore train. 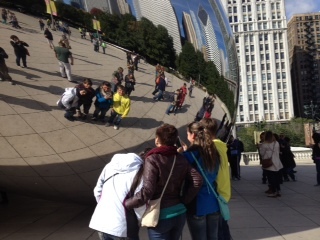 The Triton junior and senior art club members took a trip to Chicago, Ill., on Saturday, Oct. 10. The students took the trip to view and study the Magritte Exhibit at the Art Institute of Chicago. After studying at the Art Institute, the students spent some time at Navy Pier.